Pau d’Arco, Protease, and Hydrotherapy: An Interview with Judy Seeger N.D. The following is a excerpt from a phone interview with Judy Seeger N.D. on January 18, 2011. The conversation has been edited to improve readability. CHRIS WARK: Hey, everybody! I am excited to be able to do an interview today with Judy Seeger, Doctor of Naturopathy that I met actually on Facebook. Is that right? Isn’t that where we met? JUDY SEEGER: That’s right. That’s exactly where we met. CHRIS WARK: Well, let me tell you a little bit about Judy, and then we’ll get right into this. I was really excited to meet her, because not only is she a doctor of naturopathy, just like a local naturopath here in Memphis who helped me when I was dealing with cancer, but also she has been doing it for 30 years; helping people from all walks of life with all kinds of diseases, including cancer, get well. She’s got a background in psychology, biology, enzymes, herbal medicines, nutritional consulting, and really, really knows her stuff. Judy and I had a phone chat a couple of weeks ago, and I just was amazed at how much we had in common. I just really wanted to introduce her to everyone that knows me and follows my little world at chrisbeatcancer. It’s so neat because so many of the therapies that I did are the ones that you are promoting as well. And so that completely validates you to me. There are a lot of natural health, natural healing, alternative medicine practitioners out there that are a little bit on the weird, kooky, new-age side. JUDY SEEGER: That’s for sure. CHRIS WARK: So what would you say is your number-one tip to prevent cancer? JUDY SEEGER: Well, other than juicing, you’ve got to have the food plan down. That is absolutely vital. You went straight to raw foods. I tell people, depending on the cancer and what stage you have, food is the absolute foundation to prevent cancer, as well as when you have cancer. So for cancer prevention there are specific cancer fighting foods, like the cruciferous vegetables: broccoli, cabbage, brussel sprouts, red and green cabbage are all very good. Eating those raw would be great, or even just lightly steamed would be okay for cancer prevention. And then, I tell people the best thing is to have rainbow colored food. That’s a very easy way to remember what kind of foods you should eat to prevent cancer. That is blueberries, raspberries, blackberries, strawberries. And then veggies with color: yellow peppers; red peppers; broccoli, and cabbage, which is purple and green. Having all those colors at every meal will have the highest amount of antioxidants that your body can use to make sure your immune system is at the top of its game. That is the most vital thing I tell people. You have to keep that immune system strong. There are some supplements that are very good for the immune system, but what I learned is to get rid of the junk food. Then, increase the good foods that have color to them to rebuild your immune system with antioxidants. And that is a winning combination. Do you see anything happening in 2011 that will make it harder for people to take care of their health? JUDY SEEGER: I do, and because I do research all the time, people have to beware that there has been a law passed in Europe that will go into effect as of April 2011. When people in Eastern European countries want to buy supplements, if it’s over a certain dosage, they will have to get a doctor’s prescription to get them. So in other words, if they want 1,000 milligrams of Vitamin C, they will not be able to get it anymore. They will only be allowed to get 100 or 200 milligrams of Vitamin C. And that’s terrible, because that really cuts off people’s ability to heal and take care of themselves so they can live a cancer-free life. I’m seeing it here in the U.S. as well. They’re trying to do the same thing. The latest thing I just read about was they’re trying to limit the usage of drip Vitamin C IVs. And that’s a very important supplement for a lot of people with different types of cancer to make sure their immune system stays strong. So you see, the whole system is getting to be controlled by the government. They do not want us to be well. They want to control the whole cancer issue, and they want to make sure that they’re making money and we stay sick, which is why you and I are trying to educate the people so that they know how to take care of themselves no matter what the law says, no matter what the government says. There are things that people can do at home so they don’t have to worry about the government saying you can’t buy supplements unless you get a doctor’s prescription. And that’s the exciting part of what you and I have done. It’s not just based on supplements and it’s not just based on food. It’s a multifaceted approach. Once people know that and what all their options are, it empowers them. They feel a whole lot better knowing that there are different things they can do instead of relying on the government to take care of them, which certainly is not going to happen. CHRIS WARK: I think it’s important to clarify that what’s happening behind the scenes is that the Pharmaceutical Industry is actually controlling the Medical Industry through Government Regulation. CHRIS WARK: And they have a tremendous amount of influence on the FDA. The pharmaceutical industry does not like vitamins. They don’t like vitamins, or supplements, or anything that they can’t regulate or profit from. They definitely don’t like the raw food diet, because they cannot make money off the raw food diet. I did Vitamin C IVs as part of my alternative therapy and I’ve read the same thing. The pharmaceutical industry is trying to push through regulation to eliminate the use of Vitamin C IVs, even though they’ve been proven to have tremendous immune-boosting benefits and virtually no side effects and no health detriment. Why would they want to get rid of them? Because it’s a threat. They can’t make money off of it. That’s also very alarming about what’s going on in Europe with the regulation and limited access to vitamins, because you and I both know that there have been a ton of studies showing high-dose vitamins have curative effects. And it’s not the vitamins that are curing you, but when you’re sick, a lot of times you’re vitamin deficient. And when you’re pumping high doses of vitamins into your body, all of the sudden your body has the fuel and the ammunition it needs to heal itself. So vitamin C doesn’t heal you, but it empowers your body. And it empowers those processes in your immune system, supercharges it, and gives it the ammunition to fight off invaders and to heal itself. JUDY SEEGER: Right. And an important thing to know is that Linus Pauling was the one who originally came up with the whole Vitamin C protocol, and how Vitamin C works in the body. It makes the blood cell membrane, the outer membrane, super strong. So therefore, it repels those invaders that come into the body. So when the Vitamin C rebuilds and repairs that membrane and keeps it strong, then your body doesn’t have to worry about any invaders coming in that it can’t handle, because it’s like the invaders bounce off of the red blood cells. And that’s what is so cool about it. Linus Pauling, who won a Nobel Peace Prize for his work, found out that Vitamin C works. But you need mega doses of it, just like you said. It’s not just 1,000 milligrams or 2,000. Sometimes it’s 10,000 milligrams or more through a drip IV. It can take a tremendous amount. If your body is already weakened, and those blood cells are already compromised, they don’t have the ability to repel the cancer cells, which is why you need mega doses of that particular vitamin, along with a few other things. But Vitamin C is one of the most important ones. I think eventually, like you said Chris, the pharmaceutical industry will somehow take over and require a doctor’s prescription to get certain vitamins. And they’re going to tie our hands up with that. How else can we get the minerals and the vitamins our body so desperately needs? That of course will be through food. So if you’re juicing and getting your vegetables and fruit juice, now you’re getting Vitamin C. It’s not as much as you would in a supplement, but it is still a very high dosage that your body could use. That’s why juicing is so important and eating foods that are the rainbow color, because of the high antioxidant qualities. You will still be able to use them in your body and sometimes much better than using supplements. Sometimes people can’t even break down and digest certain supplements anymore. They’re that sick. I mean, that’s usually the stage 4 cancer patients that I see. If they have stage 1, stage 2, or stage 3 cancer, then they have still the ability to absorb their minerals and their vitamins through juicing and through food, and they do much better with that. Are there any special supplements that you recommend? JUDY SEEGER: The supplements that I recommend are just the ones that we’ve been saying, but they should be food based. I’m very big on herbs. I’ve been an herbalist for the last 30 years, and I’m an enzyme therapist as well. The two reasons I use both of those is the herbs are like a salad. They’re like a food. They’re medicinal. And I believe God gave us herbs to be used as medicine. And as far as the type of herbs that I recommend for people, the big one is Pau d’Arco, which is a wonderful herb that you can use as a tea. There are many of them, of course, but that’s a very common one I put most people on. Enzymes are important, because if you have cancer and you are in a tumorous stage, you want something to break up that tumor. There are only three basic enzymes that your body needs. It needs Protease for protein; it needs Lipase for fat; and then the Amylase is for carbohydrates. The advantage of Protease is that it can break up tumors. And if there’s inflammation in the body, it can bring that down as well. So taking that on an empty stomach is excellent. They do sell these at the health food store. Herbs and the enzymes, whether it’s for cancer prevention or if you already have cancer, I’m finding these to be number one. Now in my research there are all kinds of other things. There is beta glucans, there’s glutathione, there’s alpha-lipoic acid. But those get a little bit more involved, and I encourage people, if they’re going to get into that, to work with somebody knowledgeable so that they can be guided through how to use them effectively. But as for using herbs and enzymes, again it’s like a salad. Do you want to make it with radishes or without radishes? It doesn’t matter, as long as you have the salad. And so that’s why I feel it’s safe and easy for people to use the herbs and enzymes, because there’s nothing they can do to hurt themselves. There’s nothing they can do that will cause long-term side effects. They are perfectly safe. They have been around for thousands of years, and people see noticeable improvement using them. CHRIS WARK: Well, we’re both big proponents of raw foods, and one of the reasons raw foods are great is because they contain vitamins, minerals, and nutrients in a form that your body can absorb and use immediately. But also in raw foods, the enzymes are alive. And cooking destroys the enzymes in food. Basically, any heat over 116 degrees kills the enzymes. And obviously, you just explained why enzymes are so important, but it all ties back into why raw foods are so good for us, because the enzymes are alive. CHRIS WARK: Your body is only 98.6 degrees. And so even the temperature of your body does not kill the enzymes when you eat them. They survive, and they’re able to move through our bodies and obviously in a lot of beneficial ways, do their thing. JUDY SEEGER: Right, people often ask me “What are enzymes?”, and it’s really simple to explain. It’s like if you’re building a house and you have workers there, and you need to have them go in and finish building the house. Well, what are they going to need? They’re going to need lumber, and they’re going to need tools. So the workers come up to the house, and they say, okay, I have the lumber, I have the tools, and I’m ready to work. That would be your food. That represents your different types of food that you eat, protein, fats, and carbohydrates. However, you also need nails in order to build the house, and the enzymes are the nails in your body. They’re the ones that hold everything together in every single organ, every single system in your body, every single gland. The enzymes are the ones that take all the food, get them to where they need to go, and then hold them there to keep you strong and healthy. And so without that, then your body starts to deteriorate, which is why the raw foods are so important, because every one of those raw foods that you eat has all the necessary enzymes for every part of your body. So then you have a very strong body when you stay on those raw foods. CHRIS WARK: So what therapies have you seen that you would say have been the most effective? JUDY SEEGER: Well, there are three therapies I use for people whenever they’re struggling with cancer or even to prevent cancer, actually. Number one is you have to get the juicer. I think we’ve covered that really well. The other thing is to get circulation to the body. You mentioned in your story when you went through cancer how they took out some lymph nodes. Lymph nodes are the system in your body that holds the toxicity there and protects your body from getting poisoned. When they get overloaded, then there’s a blockage. Now there’s a problem, and they get swollen. So you need circulation to help that, and how I do it is something called hot and cold hydrotherapy. And that’s simply going in the shower, having very, very hot water on your body for a good five minutes and then switching to only cold for a minute. And of course, everybody screams and hollers and says,”I can’t take the cold.” But you know, what happens is the hot water brings circulation, the red blood cells, up toward the surface of your skin, which is why it gets red. Then, the cold draws the red blood cells down into the organs where it needs to go. And that action of going back and forth is what gets the circulation going in the lymphatic system and your organs and every single part of your body. That is one of the best therapies I tell people to do, hot and cold, back and forth. And repeat that at least three to five times. Now, people with cancer, I tell them they need to do it every day, because they need a tremendous amount of circulation. The other thing I tell people is to make sure that all their elimination organs are open. The kidneys need to be open, the bowels need to be open, the lungs, and the skin. The skin is the largest organ in your body, so people who use a lot of body lotion are really causing themselves harm in the long run. No body lotion whatsoever. Well, when you do dry skin brushing before your shower, that opens up the pores, gets rid of the old, flaky skin. Why is that so important? Not just because you look gorgeous and have smooth skin. It’s because having the skin open, all the pores open, allows the toxins to come out, and it allows oxygen to get into the body. When you put lotion on, it’s like putting your body in a plastic bag, and it cannot breathe. Cancer hates oxygen, so I look at every single thing I can do to get more oxygen to the body. And by having the skin open up and allowing that oxygen to go back and forth, then the body stays strong. The health of the immune system is right there, and it has everything it needs to stay well. Now, a lot of times people say, “What can I put on my skin that is healthy for it and not drying?” because I know a lot of people are in a cold-weather climate, and their skin does dry out. Well, you could use extra virgin olive oil. That’s fine. Coconut oil is very nice. You know, slather a little bit on after your shower. That’s great. But really, I lived in Wisconsin for 20 years, and when I was doing the dry skin brushing, I was doing this hot and cold just for my own healthcare, I didn’t have dry skin. I really didn’t. I had really smooth skin. And of course, I was eating as well as I could 80 percent of the time, and that made a difference as well. See, so it’s what you eat on the inside shows how well your skin is on the outside. Those are the few tips I do: juicing, the hot and cold, and making sure people do their dry skin brushing. CHRIS WARK: That’s right. It is INTENSE. And you will probably find yourself in the shower doing a little dance and hyperventilating a little bit, but by the time you get to the second or third back and forth your skin actually kind of goes numb. It’s kind of a weird feeling, but your skin kind of gets numb, and then it’s not that big a deal. But yes, I’m a big believer in hydrotherapy, and I used it a lot. And as far as the lymphatic system goes, I did a couple of things. I did that, and I did rebounding, which moves your lymph system a lot. And then, just some running and some exercise like that, just to get it moving as well. So yes, I did all that stuff. JUDY SEEGER: Sure, thank you. The Cancer Cleanse Camp is just really something that I have a huge passion for to put together to help people in different stages of cancer. Everybody’s invited, no matter what kind of cancer they have. And what we’re going to do is we’re having people such as yourself, Chris and other speakers who have had cancer. We’ve had speakers who have had breast cancer, thyroid cancer, brain cancer, all different types, who will be speaking and sharing their experience of how they overcame it, so that people could actually meet and talk to them and say, hey, this is what I have. How do you think this will work? etc. And we also will have professionals there who have been doing raw food for many, many years. And they will be serving some delicious raw-food smoothies and food. They really are going all out and making some wonderful dishes for us. And also we’re having therapies that people can actually go into and experience. We’re having a mild hyperbaric oxygen chamber there. People can go inside and see how oxygen helps their body. And we’ll also have ozone therapy there with a steam sauna. And we’ll also have ionic foot detox baths. These are all therapies that people can experience and then of course learn more of how it works for their cancer, because we know that cancer hates oxygen. But they don’t really know what it takes to get rid of it using the right kind of oxygen. And these are all safe, FDA approved, perfectly fine for anyone to do in their own home, but they need to experience it. They don’t really know what it’s about until they’ve gone. And I’ll be there to answer questions. And then of course, we’ll have time where we’ll be going through some talks about emotional healing, because wtih cancer, there’s an emotional component that people need to know how to work through: Why they got the cancer, how to work through the emotions. And we’ll be having some teachings on that. So in three days I’m really packing it in. I only limit it to about 25 people, and that’s so that everybody has a chance to go in the therapy. Everybody has a chance to talk to the speakers, and we really get some one-on-one time with people. And so this will be held in Cocoa Beach, Florida at the International Palm Resort. It’s right on the beach. It’s a gorgeous, gorgeous area. And it will be held on February 18, 19, and 20. It starts on Friday afternoon, goes all day Saturday and Sunday. If people want to know more information about it, they can pick up the phone and chat with me. They can call me at 321-403-9447. So that’s something that I’m hoping we’ll be able to put together here that enough people will benefit by it and see what they can really do to take care of their cancer within three days. To get enough knowledge so they get empowered, because as we’ve been talking, Chris, the biggest thing is when you have a plan, you feel empowered. When you have knowledge, you feel empowered. And we don’t want doctors taking that away from anybody anymore. We really want people to have the knowledge that they need to get over their cancer. CHRIS WARK: Yes, that’s critical. This sounds like a really, really great event, too, because one, it’s hard to find time to really read up and learn and make a big lifestyle change. And a weekend retreat like this is great, because it’s packed full of information. You’re focused on one thing, and you know, the people that come can really, really soak it in and walk away with just a massive amount of knowledge. You know, it’s sort of like drinking from a fire hose, which is great. And I want to stress too that this isn’t just for people with cancer. This is for anybody, and correct me if I’m wrong, but it’s also for anybody that wants to just make a dramatic health change and just needs a little shot in the arm to get there. A retreat like this would be awesome for that, wouldn’t it? JUDY SEEGER: Yes, exactly. People are worried about 2011 and the healthcare system. They’re worried that there are people in their family who have had cancer, and they’re thinking maybe they’ll have it. They’re worried about the pharmaceutical industry. So yes, of course, if they came, they would be able to experience all this, see all this, taste all this like no other event that’s being offered in the country right now. So the knowledge, like you say, that they will walk away with will be massive. CHRIS WARK: That’s great. Well, Dr. Judy, thank you so much for taking some time out of your day to talk to me. I’m so excited that we were able to do this and I can share it with the folks that subscribe and visit my site. I think you’re fantastic, just a terrific person. Everything that comes out of your mouth, it’s like your pulling it from my brain. It’s like we’re sharing a brain. [laughs] So many of the therapies you recommend, I did. The diet, the lifestyle changes, the emotional issues, and the spiritual issues that you do have to address when you have cancer, you’re right on the money. JUDY SEEGER: And you’re the living proof. Here you are seven years later and no cancer. CHRIS WARK: Yes, that’s right. I am living proof, and it’s so great to find someone that is preaching the same message as me. Thank you again, Judy, and we will talk to you soon. 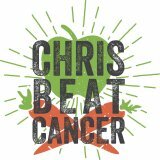 JUDY SEEGER: Thank you, Chris. I appreciate it. « Q&A: Breast Cancer at 32, What to do?